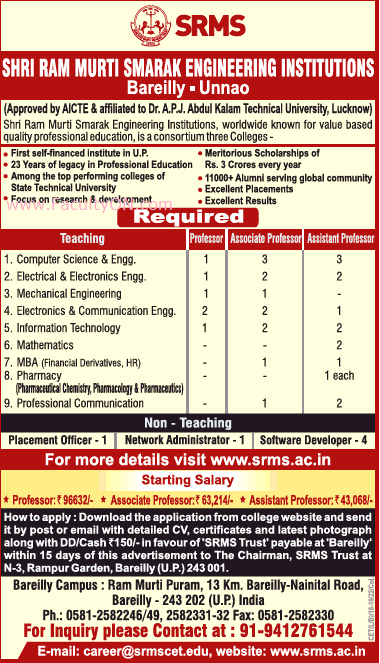 Shri Ram Murti Smarak Engineering Institutions, Lucknow has advertised for recruitment of Professor / Associate Professor / Assistant Professor Plus Non-Faculty jobs vacancies. Interested and eligible job aspirants are requested to apply within 15 days from 28th November 2018. Check out further more details below. About College: Shri Ram Murti Smarak International Business School (SRMS IBS) is a knowledge centre for industry and academia. Our faculty are well known subject-matter-experts with years of continuous interaction with Global and Indian industry. Their experience is reflected in their research papers, books, consulting projects and editorials in leading newspapers, journals and magazines. SRMS IBS is promoted by Shri Ram Murti Smarak (SRMS) Trust, Bareilly; a prestigious and renowned name in the field of technical and professional education since 1996. How to Apply: Interested and eligible candidates are requested to send application in prescribed format along with copies of certificates and recent PP size photo to the postal address provided below.